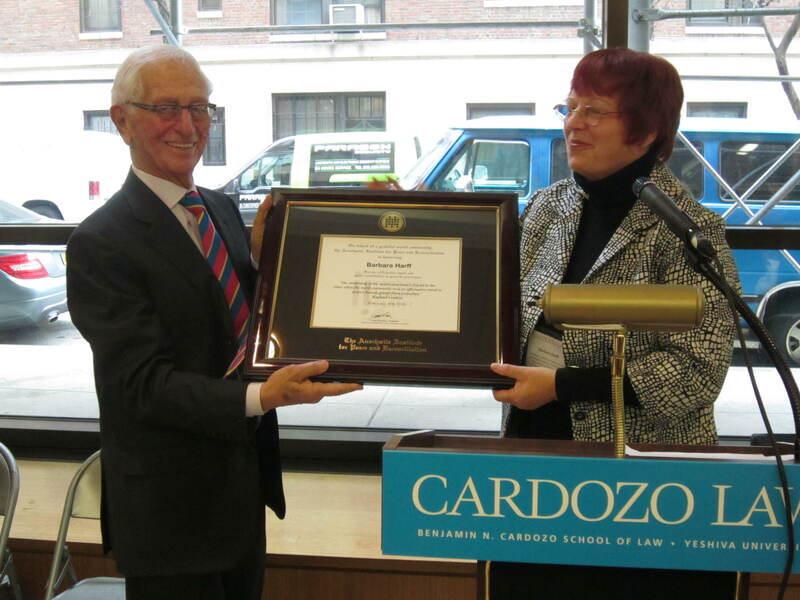 Auschwitz Institute president Fred Schwartz awarded the 2013 Raphael Lemkin Prize to Dr. Barbara Harff this week at Cardozo Law School in New York, in recognition of her outstanding contribution to the cause of genocide prevention. In her acceptance speech (full text below), Dr. Harff emphasized the need for better governmental early warning systems, and offered a list of areas for research that would aid in that effort. Dr. Harff, Professor of Political Science Emerita at the U.S. Naval Academy in Annapolis, Maryland, pioneered the systematic comparative analysis of the preconditions of genocides and political mass murders, and continues to prepare updated global risk assessments for governments, the United Nations, and NGOs. Past recipients of the Auschwitz Institute’s Raphael Lemkin Prize are Wesley Clark and Deborah Lipstadt (2012), and Carla del Ponte and Juan E. Méndez (2010). The award ceremony was held during the February 26 conference Deconstructing Prevention: The Theory, Policy, and Practice of Mass Atrocity Prevention ,” co-organized by the Auschwitz Institute and the Benjamin N. Cardozo School of Law Program in Holocaust, Genocide, and Human Rights Studies. I was asked to talk about my research and what it has meant to be a genocide scholar for some 30 years. So let me take you on a journey into the past, that is, to the dawn of comparative genocide research. It is 1982: Upon returning from my first academic job in Melbourne, Australia, I gave my second scholarly paper at the International Studies Association meetings in Cincinnati. I presented the findings on a comparative survey on attitudes toward genocide and intervention to an audience of two—one of whom left after 10 minutes. 1988: This time we did better at the ISA meetings in St. Louis. Participants on two roundtables included pioneering genocide scholars Hilda and Leo Kuper, Helen Fein, Kurt Jonassohn, Frank Chalk, Herbert Hirsch, Roger Smith and Michael Freemen ( a British political theorist). We attracted an audience of about 30—including some Holocaust scholars, somewhat suspicious, who were wondering what we were up to. Here definitional issues and the uniqueness of the Holocaust took up much of the ensuing debates. 1995: the founding of our Association of Genocide Scholars in Williamsburg—that brought all of us together, though many of us had met before. We were from the beginning interdisciplinary: sociologists, psychologist, historians, political scientist, international law scholars, philosophers—all came together trying to explain mass atrocities and hoping to find ways to prevent their re-occurrence. In my view the strength of our community rests upon the recognition that disciplinary boundaries are artificial constructs. We need to learn from each other—only then can we understand why and how ordinary men become mass murderers, how group dynamics impact on individuals and vice versa, and why governments abandon civilization and kill their citizens en masse. How do political leaders use national resources to mobilize and energize bureaucrats, the military and police to conspire and participate in mass killings of members of groups designated as enemies? Back one year to 1994: For me one of the more important events was the founding of the State Failure (now Political Instability) Task Force on the initiative of Vice President Al Gore. He wanted to know why revolutions and ethnic conflicts occur with some frequency, and why some regimes collapse. Genocide—and I added the term politicide—was on the bottom of the agenda. The task force was to use empirical research and statistical tools to evaluate existing theory and develop risk models. Not only was I the only female on the task force for a number of years, but last in line to receive attention for my research agenda. I think there was interest in the State Department and I was chosen because I knew empirical research, had published some quantitative analyses (testing empathy or the lack of it), and brought a dataset and the crazy idea that one needs to test hypotheses to be taken seriously by the scientific community and, even then, a lot of people in the military and intel community. It was a dream come true to be potentially heard and taken seriously by the policy community. This had always been my target audience, not just other scholars. In my view, scholars need to listen to people in the field and those who make policy decisions. Not the least to better understand what they need from us. Just imagine if we could work together in preventing mass atrocities! Over the years the policy community has recognized that genocides and politicides have happened many times since World War II, and accepted politicide as a concept although the Albright-Cohen report still uses the term “mass atrocities.” Now imagine if we could offer in return a conflict resolution toolbox tailored to deal with pre-genocidal violence. Ideally we could develop response scenarios that would take into consideration cultural differences and the capacities and interests of potential interveners. Let me briefly and boldly assess the state of our discipline. How are we doing? We have lots of good case studies and could use more, past and present, especially of high-risk cases to learn more of how to prevent escalation into geno/politicide. Explanations—we are doing OK. To advance the field we need quantitative as well as qualitative analysis. We should not insist that quantitative analysis is the only way to proceed. Yet why not emulate the hard sciences? Probabilities are better than educated guesses. I don’t know how many times I had been tackled by prominent scholars such as Seymour Martin Lipset—on how I could do serious research, meaning using accepted scientific tools on a topic that has neither the necessary number of cases nor significant number of scholars ready to generate reliable data and test hypotheses. For me the task from the beginning was to do case studies—identify historical cases (I did put together a formal dataset identifying 46 cases post-World War II) and generate data for causal variables identified by my fellow researchers. The next task was to test models in order to do formal risk assessment, allowing for replication to improve our current assessments. I have seen within the last year at least three papers to be published by other scholars that test and retest the model used in my original risk assessment in 2003—using more sophisticated analytical tools and adding new data. Risk assessment we do fine—early warning, not so. Here I mean tracking daily relevant political events based on models designed to explain the dynamics of genocidal evolution. I had done it for the Clinton Administration—it was too time-consuming—and yet we learned a lot by doing it. That is, we were able to identify factors that rapidly escalate skirmishes to genocide. It is simply not enough to take snapshots at yearly intervals. We need time-sensitive models that can be used as tracking devices to know where countries are in conflict development. A word of caution—it is simply not enough to rely on country experts (I was one—on the Mideast). Knowing what happens globally and in the neighborhood, or which situations would attract international attention and where we are in conflict development and what type of conflict we can expect, go beyond the training of country or area experts. At the same time, reality checks for fine-tuning responses are very much in the realm of area experts. 2004: The highlight of our community was the Stockholm Forum on the Prevention of Genocide—and here I want to give special recognition to Yehuda Bauer, without whom this conference would have not taken place. Once upon a time, Yehuda was thinking of the Holocaust as unique—he has changed his mind and has become an advocate for the genocide community. Why was Stockholm so important? It brought together heads of state, foreign ministers of 55 countries, policy makers, scholars, activists, and promises to end genocide in the 21st century. I had suggested inviting Rwanda’s President Kagame, who after receiving a copy of my then-risk assessment, which showed Rwanda still as a possible candidate for genocidal violence, publicly declared that there would never be another genocide in Rwanda—we’ll see. And this is what we want, a political leader who is sensitized to international opinion and who recognizes that others are watching. Let me conclude with some suggestions to the very talented younger generation and the policy community. We are short on studies that give us hands-on advice to deal with not just future Macedonias, but future Burmas, Syria, Indonesia, and Rwanda. These are some lessons learned through my early warning tracking research which could help guide future research agendas. Track refugees—those who cross borders and those who are internally dislocated—and find out how rebel groups and the government deal with such people, including neighboring countries that provide so-called safe havens. Track small arms flow and external support for rebels. These actions often provoke governments to preempt perceived threats. Check on state capacity to deal with crises. Weak governments may respond to unrest with disproportionate violence. De-ethnicize conflict. Stop hate propaganda—consider counterpropaganda. Track behavior of kindred groups in neighboring countries. Track militia development. Avoid catering to minority political elites. International actors need to provide human security and stabilize borders. Empty threats are counterproductive. Sometimes good intentions have unintended consequences. Let me give you one odd example. We tracked Indonesia for a number of years—in 2002 the expulsion of Saudis from Maluku increased membership of the militant Laskar Jihad. Now to Syria: it was highest and second-highest on our last two risk lists before escalation to extreme violence—we are talking about geno/politicide. What to do? Considering the Assad regime’s past murderous treatment of the Muslim Brotherhood, it should come as no surprise as to what has happened in the last two years. Of course we are hamstrung by the neighborhood and the odd combination of countries that to some degree still support the regime. Western observers have always underestimated the strength of tribal ties and kinship in Arab societies. In addition, Shi’a and Sunni loyalties cannot be underestimated. We will have to deal with the axis that links Iran, Syria, Hezbollah, part of Afghanistan, most Bahrainis, and possibly northern Yemeni Shi’a. And we have to moderate Saudi influence in Sunni-majority countries. Let me conclude on a personal note. As a German-born genocide scholar, I wanted retribution against Nazis responsible for the death of millions. But as a teacher, I had to reign in my emotional and instinctive responses and teach respect and tolerance as a base for human interaction. Yet as genocide scholars we cannot tolerate the criminal behavior of perpetrators. We have to take sides to save the many. The challenge is how academic research can contribute to that goal.